Try this simple, light weight Hand-Held Plastic Gourmet Garlic Press kitchen tool to extract fresh flavor to enhance your favorite pasta, vegetable, and meat dishes. Simply place the whole garlic or garlic clove in the cup and press the handles together. One of the convenient tools for the kitchen, this garlic press is just right for making garlic oil or garlic salad dressing. This garlic press is also a nice additon to your camping equipment to bring a flavor of home to your campfire cooking. No mess and no hassle! Lightweight plastic Makes this kitchen gadget easy to handle and use at home, in the RV, or tent camping. Bright color Makes this garlic press easy to find in the utensil drawer. 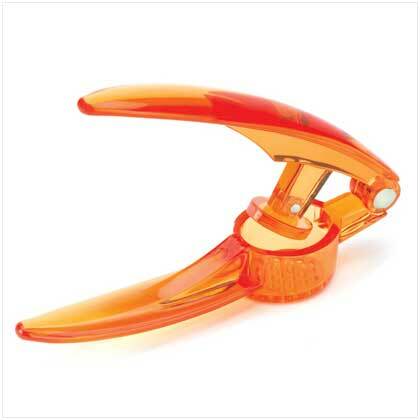 Garlic press Extracts the wonderful flavor of fresh whole garlic in one quick squeeze.